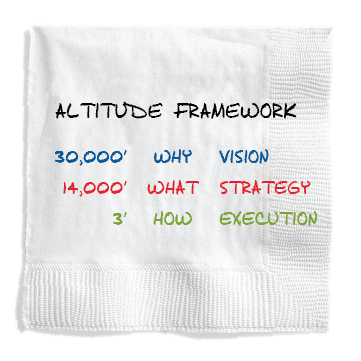 Our most used framework is the Altitude Framework – Used to order thinking, communications, and storylines; to develop Engagement Tools; and, to think through the Flow of a Visit. At 30,000’ leaders and visionaries have the ability to see the horizon. Obviously, you can’t do that from 3’. At 30,000’ you can see the curve of the earth, the rising and setting of the sun. Theperspective at 30,000’ is unmatched. This is where you can think about making a “dent in the universe” and communicate how you are CHANGING THE WORLD! Why do you what you do – To what end? What makes you unique or how are you collaborating to solve a big social problem? Use the answers to these questions to develop your Message at 30,000’ – Your big picture purpose statement, the meaning of your work – Something we call the Blue Box Message. Changing the lives of the visually impaired worldwide.Transforming the aging experience. To provide the finest liberal arts education in the country. Breaking the cycle of poverty by changing the system. Transforming Columbus: Inspiring the entrepreneurs of the future. Strong Healthy Kids, Strong Healthy Families, Strong Healthy Communities. We provide the opportunity for disadvantaged women and children to transform their lives. We want safe water for EVERYONE FOREVER. To make reading matter and change the story for low-income students and families in San Diego County. Redefine Interprofessional Education. Redefine Healthcare Delivery. For Better Patient Health Outcomes.